Science is philosophy. Disciples of philosophy define what is evidence and how to interpret it with their philosophy. All systems of philosophy are belief systems. Greek philosophers tried to find a belief upon which to construct a natural science starting 2600 years ago. Despite centuries of debates, they were unable to resolve the problem of matter continually changing itself. In the last days, Peter prophesied, mockers will come. They will obfuscate (Greek lanthano) the age of the plural heavens and Earth’s watery history with their arche ktiseous. This Greek phrase can mean their first law. Peter predicted it as: all things remain the same. Indeed, western science was founded on the fundamental belief that the properties of matter are fixed, not emerging. Scientific definitions of matter, time and energy; most empirical measuring units; many scientific methods; mathematical laws and constants were built on the faith that atoms do not change as they age. True believers interpret all evidence with their fundamentalist beliefs. There is one place where ordinary people (outsiders to science) can test the scientific creed. We can see the history of the universe, how the galaxies formed, back to near the creation era. What we SEE exactly fits the descriptions in the Hebrew text of the Bible (but not modern philosophical interpretations of creation). We taxpayers pay billions for huge telescopes that gives us the right to look at the pictures from long ago. The most-distant galaxies take up tiny areas of our sky and their dim light shines at tiny fractions of the frequencies emitted by modern matter. At many ranges and in all directions we can compare how the galaxies changed appearances as they also changed their light frequencies. Even local galaxies continue to grow from the core of each galaxy. We observe (at many ranges) how billions of galaxies spread out and grew into huge, local, growth spirals as the stars continued to emerge from countless unformed-matter cores. What God created at first was formless, Genesis 1:1 – 2. Then in unbroken continuity He continues to command light to continue to be. Indeed, in unbroken continuity, light continues to dither around within matter, giving it the ability to have extension. We observe unformed matter continuing to receive form as stars continue to form and spread out. What we observe exactly fit the grammatical record of creation as well as several other passages in the Bible that refer to the plural heavens continuing to spread out. Scientists have filled the universe with myths. The scientific universe was created by a magical vacuum explosion that created everything out of nothing. Allegedly 84% of the matter in the universe is invisible. The spreading vacuum of space time makes up 70% of all active processes in the universe. As the vacuum of space time stretches itself, it changes the frequency of all light. and acts against gravity to force galaxies to spread apart. In the scientific universe, invisible black holes are instrumental in causing stars to accrete from space dust that allegedly formed from the big bang. Supposedly invisible matter bends light in the vicinity of galaxy clusters so that scientists do not have to believe what is visible. If one denies the fundamental faith upon which science was built, that the properties of matter are fixed, then you can accept cosmic history exactly as we see it in all parts of the light spectrum. Without the philosophical creed of science, there is no basis for these scientific myths. 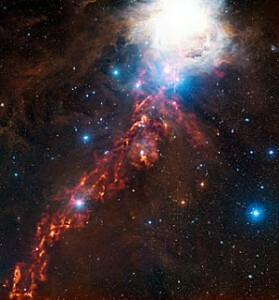 The photo is from NASA of a great jet spreading out in the nearby Orion Nebula. All over the universe jets of stars and gas emerge from active stars and active galactic nuclei.